One of the most exotic raw material used by Stone Age cultures in North America was Quartz Crystal. Although rare, examples of tools and fluted spear points made of crystal have been discovered on Clovis culture sites across the United States. 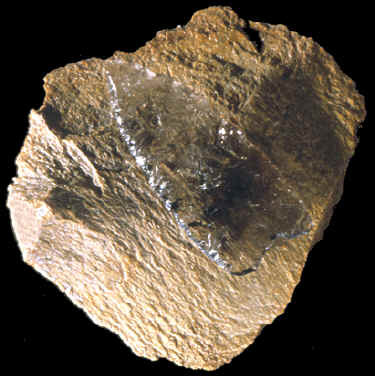 The Clovis point pictured above is laying on top of a percussion flaked piece of mammoth bone from the Lange-Ferguson mammoth kill site. 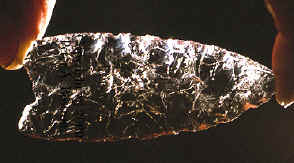 This Clovis point is one of three examples that were discovered in the Fenn cache. This point has multiple channel flakes removed from each side. 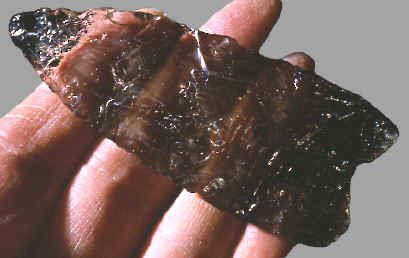 It is made of smoky quartz crystal and measures 3 3/8 inches (8.5 cm) long. The above pictures show two more views of this quartz crystal Clovis point from the Fenn cache. The crystal is very clear but is slightly dark.